I am a guy who has used the XL1 a lot professionally, and since then the warranty on my XL1 has long since lapsed as you can see by the attached j-pegs. I have noticed that all the experts on the Watchdog seem respectable, and give the aura of respectable professionals. I would therefore not be surprised when the following, admittedly brutal looking modifications, do not fit into the concept of the website. In spite of this fear, I would like to put these images and my experience at your disposal if you would like, maybe under the title "Frankenstein meets XL1." In my own defense, the following modifications to my XL1 are of a working prototype nature and as long as they have functioned, I have not felt the need to make them look "good." I have a reputation for overdoing it a bit with hot glue, of which I am not ashamed. I do a lot of hand held shooting. One of the first things that irritated me, not only on the XL1 but on big Beta Cam cameras and even on DV cameras with folding LCD or TFT screens was the non-orientablility (if that�s a word) of their viewfinders and screens. 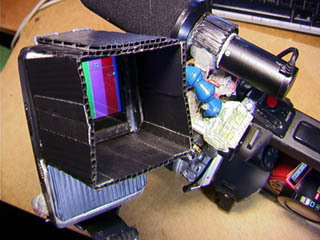 I took the lightest TFT monitor available at the time which had a video-out jack. 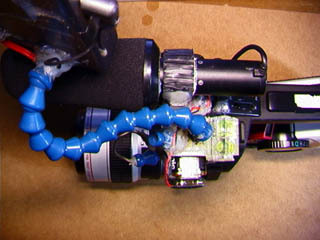 I channeled two wires for the power and two wires for the video signal through a flexible plastic tubing, which film professionals will recognize from french flag constructions. This tubing is actually used on metal laths and boring machines to deliver cooling fluids to the machine bits. The tubing I used, is produced by a company in Germany called Loc-Line (they have a web site). I had to distance the batteries from the TV in order to make it as light as possible. The one disadvantage to having a flexible monitor is that one tends to lose track of the horizon, or rather one is used to using the edge of the screen as a vertical reference, that�s why I glued a spirit level onto the base assembly, which is fixed to the camera. I operate this monitor / camera configuration by holding the monitor in one hand while shooting. 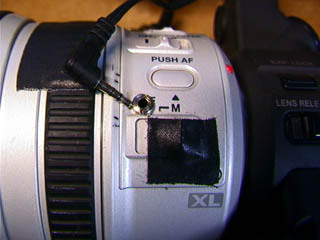 I can thus move the camera freely while always having the same angle between my eye and the viewfinder. It takes a little getting used to but I prefer it much better than craning my head around and twisting my upper body to get a good look into the viewfinder while shooting fast changing action. The hood is made out of light-weight corrugated plastic, used sometimes for cheap foldout drawers. It�s still not much use while shooting in bright sunlight, but it can help in some situations outdoors. One drawback of this construction is that the flexible plastic tubing sometimes squeaks, so it can kill a take where the audio is important and is being recorded over the onboard mic. 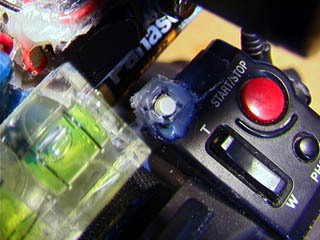 One other thing, is that this construction was originally made without changing anything on the camera body itself. 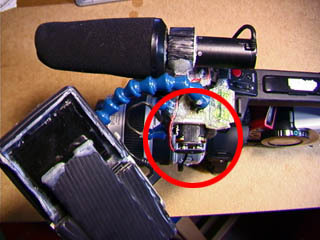 I later fed the video signal cable through the body hand, which wasn�t difficult, and in doing so I made two holes in the camera body for the cable. The second modification came about due to my frustration with the "XL1 way of focusing� (I hate it!). I think it�s the camera�s biggest drawback. So, my workaround was drastic. I jumped the "auto focus� button on the lens with a mono mini jack. I had to file some of the lens housing away, so that the jack I had would fit. 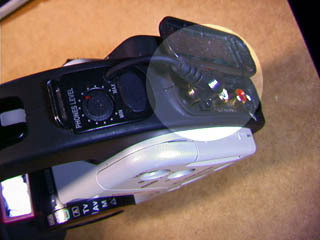 I then placed a button on the body handle where I could get at it with my camera hand. I leave the lens in manual focus mode all the time and tap the "auto focus� button when I need to grab focus. It still doesn�t really help with tracking focus though. The Watchdog notes: Daniel has provided some of the most interesting XL1 images I've ever seen, but has also obviously voided his warranty. Don't try this at home... or rather, if you do, don't try to send it back to Canon for service. If you have any questions for Daniel, he can be reached at the DVinfoNet Community message boards. Inside every hardened criminal beats the heart of a ten-year-old boy, and vice versa.